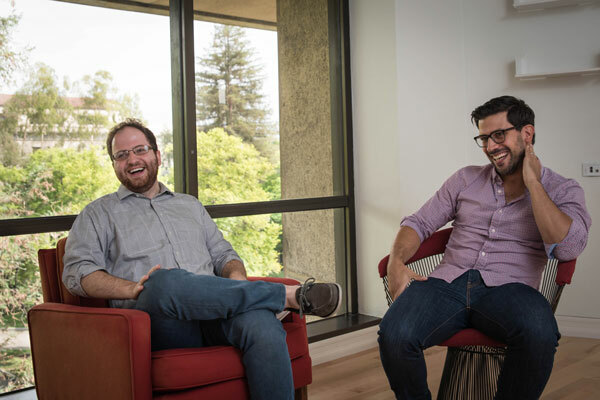 Gabriel Lopez-Moctezuma and Michael Gibilisco are Caltech's two newest political scientists. From their offices across the hall from each other, they are getting to know the campus and getting to know each other. Gibilisco received his PhD in political science from the University of Rochester in 2017. Lopez-Moctezuma received his PhD in politics from Princeton in 2016 and then spent a year as a postdoctoral associate at Yale University's Cowles Foundation. Lopez-Moctezuma examines collective decision-making in institutions such as the U.S. Senate and the Federal Open Market Committee (the body in charge of implementing monetary policy in the U.S.). Gibilisco applies game theory to conflict and compromise between groups and studies how minority rights can be effective tools to decrease conflict. We sat down with them to talk about why they came to Caltech, their first impressions of each other, and what they're learning from today's political environment. Political science is maybe not the first thing that comes to mind when one hears "Caltech." What drew each of you here? Gabriel Lopez-Moctezuma [GL]: In fact, Caltech pioneered the use of formal mathematical models to explain political behavior, including models of voting and bargaining. Later, when experimental economics (the use of experiments to test theories in economics) was developed here as a field, it began providing important insights into political science. The research I do would not be possible without these early contributions, so it is a privilege having been invited to collaborate at Caltech. Michael Gibilisco [MG]: The research nature of the Institute permeates everything here. Having colleagues, administration, and everyone treat research as their top priority makes this an exciting environment. Also, all the talk about collaboration is pretty exciting. Here, political scientists are right next door to economists and right next door to neuropsychologists. We often tackle similar problems like voting or bargaining in legislatures, but from very different approaches. You're both political scientists, but that label doesn't capture the depth of what each of you study. Can you each describe where your research interests lie? GL: I'm trying to understand the role of political institutions, electoral rules and voting procedures in group decision-making—from small committees of policymakers to large groups of voters such as the U.S. electorate. I use simplified models of the political context, along with data on political behavior to determine the preferences and incentives that lead individuals to take one position over others. As an example, I'm trying to understand the effect of deliberation among policy makers on the policies they implement and answer what would happen in hypothetical scenarios where we change the way members communicate. MG: I study political institutions and constitutions and their effects on group conflict and compromise. Some of the research questions I tackle include how to design constitutions, presidential powers, or political institutions like legislatures in order to decrease conflict and increase compromise among multiethnic groups. For example, how do we know when we create rules that they will last over time? We would like to know that if we create some institutional protections for minorities, that in the future, majority groups wouldn't just remove those protections. Do you have any questions about each other's work? GL: Mike, I wonder whether you have an example of a conflict that brought you into this particular field? MG: Gabriel, there are committees everywhere. How did you become interested in studying the Federal Open Market Committee? GL: The main reason is that the internal process of decision-making is an understudied topic for this committee and other policy-making bodies. The fact that records of deliberation are publicly available for the FOMC is ideal for understanding the mechanisms through which aggregate choices are made. GL: Soon, I hope. The thing that is interesting about Mike and I starting this year is that we have overlapping research interests and a similar way of thinking about research in political science. When we talk about potential collaboration at Caltech, hopefully it will start right here with us. Politics seem to be everyone's obsession these days. Is there any academic interest in today's politics for either of you? MG: As someone who studies political institutions, especially protections for opposition groups, I'm closely following the debates over Senate rules. We've been seeing current leaders tweet or make statements about getting rid of the filibuster or altering protections for the minority party in the Senate. These are very interesting data points because these rules don't usually change. GL: It's interesting thinking from an academic perspective about the sequence of choices both candidates made in the recent presidential election and being able to isolate which of those choices actually had the largest impact in the surprising election we observed last year. In the years to come, it's going to be an important research topic. GL: I don't know if it's surprising or not, but I'm a huge fan of soccer. Growing up in Mexico, you dream as a child to become a professional soccer player. Early on, I realized that was not going to happen, so I just became a fan. Particularly, I love to watch international matches whenever Mexico plays. MG: So, funny story. I applied to Caltech for grad school but I never heard back. I do hope to one day become a Caltech PhD.